The Bears enter this Friday’s contest against a Jeanette Jayhawks team that is also undefeated, with both teams boasting a 5-0 record. 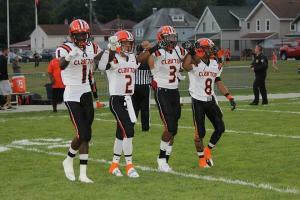 Clairton head coach Wayne Wade is pleased with his team’s execution so far this season. And score they have. Clairton has outscored opponents by a whopping 372-13. Quarterback Ryan Williams who, through the first five games of the season has thrown for 1,060 yards and 16 touchdowns, spearheads their fast paced, high scoring offense. Four of those touchdowns came in last Fridays 72-0 dismantling of the Riverview Raiders at Neil C. Brown stadium. Wideout James Hines was on the receiving end of two of Williams’ touchdown passes, while receiver Aaron Matthews added another score. Matthews will be a player to watch not only in this week’s game, but also all season long. The 6-5 Matthews has the potential to be a top prospect in the coming years, as he is only a sophomore. Bears running back Lamont Wade contributed 11 carries for 167 yards, also scoring two touchdowns last Friday. Clairton’s defense did its part, contributing an interception returned for a touchdown in the win. The Bears did lose something last Friday; two players were ejected, meaning they are suspended for this week’s game. On top of that five players were lost to injury during the game. The losses won’t change the Bears’ game-plan much, according to Wade. The Jayhawks do indeed bring something different: a comparable record. They will certainly be Clairton’s biggest challenge this season, and barring any monumental collapse, this game will decide the victor of the Black Hills Conference. Jeanette’s offensive numbers are not as striking as Clairton’s but are impressive nonetheless. The Jayhawk offense has put up a solid 243 points combined this season. A week ago, in a 41-7 win over Springdale, the Jayhawks posted 327 yards on the ground. Quarterback Julian Batts ran for 101 yards and completed five passes for 85 yards and two touchdowns in win. Batts wasn’t the only one to contribute through the air, as running back Gio Vonne Sanders used his arm to find receiver Seth Spino for a 70-yard touchdown pass. “One of the keys to the game will be containing the QB,” Wade continued. Clairton will have to do just that if they want to win, not only the game, but also take the conference. The Bears and the Jayhawks will meet at 7:30 PM at Clairton’s Neil C. Brown Stadium. Tonight’s game is the Pittsburgh Sports Report and US Steel Game of the Week. Students and fans, be sure to take plenty of pictures and Tweet them to @PghSportsReport #Bears. The best photos will appear online after the game!